Just take a look at their menu. Nuff’ said. Well, it turns out that making a map of the whole world at once made the numbers quite illegible. Therefore, I’m breaking it up by continents. Here’s Europe, which is probably the busiest of all the continents. The red numbers represent the American items on my to-do list yet to be done. The blue numbers are the things on the list that I’ve already accomplished! Plans are made. Dates are set. Another item will be struck off of the infamous Travel To-Do List! We got tickets to Schlitterbahn, so I’ll be able to cross #48 off of my travel to-do list later this summer! So excited!! It’s been WAY too long since I’ve been to a water park. Well, my giveaway to celebrate striking off #38 off of my Travel To-Do List failed. Miserably. Not one person entered the contest for our Baseball Food Pyramid Water Bottle. So, my decision is to give the bottle to my blog’s 38th follower. Currently, Erika Hits the Road has 31 followers, so I’m close to having a new owner for our bottle! We’ll keep you posted. ACHIEVED! 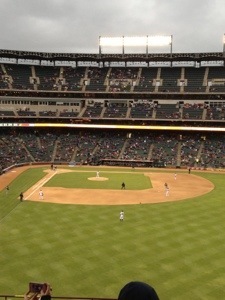 Last Thursday, my husband and I attended a Texas Rangers baseball for his birthday. We had All-You-Can-Eat seats, and it was amazing! We had football weather for our first baseball game. Despite the fact that is was May 2nd in Texas, the temperature was 44 degrees. This didn’t bother us at all! The wind, on the other hand, was killer. Not only did it blow Alan’s hat off his head, it blew some of my nachos straight out of my tray. It also blew Alan’s chicken sandwich out of his hand. We settled into our seats and bundled up to watch the game. 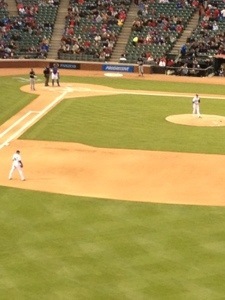 Justin Grimm pitched for the Rangers against the Chicago White Sox. Incredible watching a great baseball game in person. All the vendors walking up and down the aisles, sold everything from cotton candy to cold beer. The poor beer guy wasn’t selling any “cold ones” that night. At first, he tried simply yelling “BEER” but no one was buying. “Well, if I told you it was cold beer, nobody would buy.” Then, he started yelling, “hot beer” but most people were going inside for coffee. We happily watched the game until the very last pitch, leading our section in the usual chant of “Let’s go, Rangers, let’s go!” Unfortunately, the score didn’t change. My feet were frozen and my face was numb but I wouldn’t change a thing (except for the final score, of course!) Alan and I still had smiles on our faces as we trekked back to the car, taking with two free Rangers shopping bags which were that night’s promotion. It was a night to remember, indeed. Now that #38 is to-done, I look forward to crossing the next item off of my to-do list. 4. Eat at every Wolfgang Puck restaurant. I’ve already knocked two off the list! 7. Ride a train from Paris to Venice. Okay, this one is technically my mother’s but it’s a really good one so I’m stealing it. But I would do this one with my parents! 10. Take my husband to Panama to visit the Canal and friends. I’ve been twice to Panama but never with the love of my life! 16. Visit all thirteen original Colonies. I’ve been to Massachusetts, New York, Georgia, South and North Carolina. 23. Eat baklava in Athens while looking at the Parthenon. 26. Paint an impressionist painting in Tahiti or as I like to call it: going Gauguin! 31. Sing the opening song from “Sound of Music” on the hill. I know this one’s corny but I’m a theatre geek so cut me some slack, y’all. 41. Attend Disney’s Annual Pirate Party. In costume, of course! 46. Visit Buda and Pest! 51. Travel back in time to Colonial Williamsburg! 61. Can’t go back to Constantinople but I can go visit the Hagia Sophia in Instanbul! 74. Place a bet on a roulette wheel in Monte Carlo. Can’t guarantee I’ll win! 89. Tour Highclere Castle while secretly pretending to be the fourth Crawley sister, of course! 90. See the tomb of Qin Shi Huangdi. C’mon, I built my own model of the tomb when I was thirteen. Time for me to see my inspiration! 101. Eat Seoul food. This one might be a little more difficult as I would have to find vegetarian dishes! 109. Take a road trip with all of my nieces at once! 112. Go parasailing in Hawaii. 115. Buy my husband everything he needs to make dinner from Chatsworth House Farm Shop. 120. Visit the ABBA museum in Stockholm, Sweden. 121. Oh my God! How did I forget visit Neuschwanstein Castle?! I’ve wanted to go there since I was five! 122. Take a cake class at Charm City Cakes in Maryland. 123. Make enough money to do the previous 122 121 120 items! So, today, my husband and I went with my mom to see the new James Bond movie, “Skyfall.” Fantastic movie! As always, our hero travels the world chasing after baddies. In honor of the movie’s fabulous international locations, I have gathered a small collection of songs from each of the places. Enjoy!